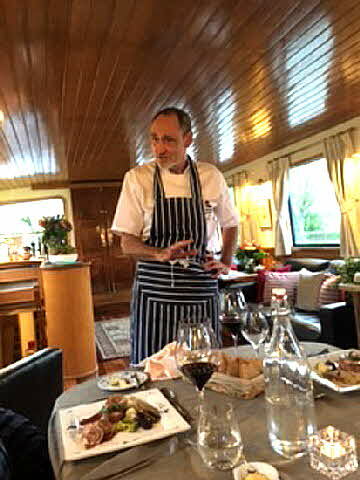 European Waterways operates barge cruises in France, Italy, Holland and Scotland, offering passengers a delicious relaxing way to tour, taste and discover the countryside. Each itinerary includes: memorable excursions to local markets, wineries, and important historical cultural sites. 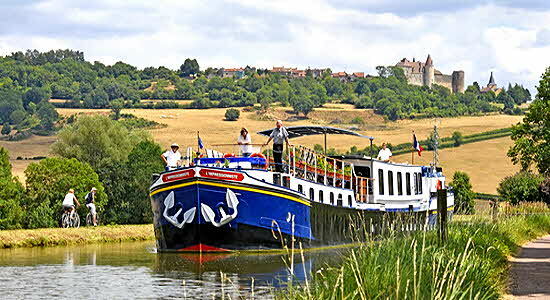 L’Impressionniste, converted into a 12 passenger luxury hotel barge in 1996, now cruises the Burgundy Canal from Escommes to Fleury sur Ouche. The cabins, with en-suite baths, range in size from 110 feet to 143 feet. Fares for a six night cruise are approximately $5,000 per passenger and include all meals, wines, cocktails and excursions. After a smooth overnight flight from JFK to Paris on XL Airways, we begin our adventure at the beautifully appointed Westminster Hotel, a member of the Warwick Group of luxury 5 star properties, conveniently located close to the Louvre, shopping and a wide choice of outdoor cafés. A sumptuous buffet breakfast, included in our rate, is served in an elegant charming dining room. The European Waterways van picks us up at the hotel on Sunday afternoon. The drive to the L’Impressionniste passes quickly; the French countryside is ablaze with fields of yellow rapeseed flowers; herds of white cows graze contently; stone farm houses and medieval castles climb the hillside. 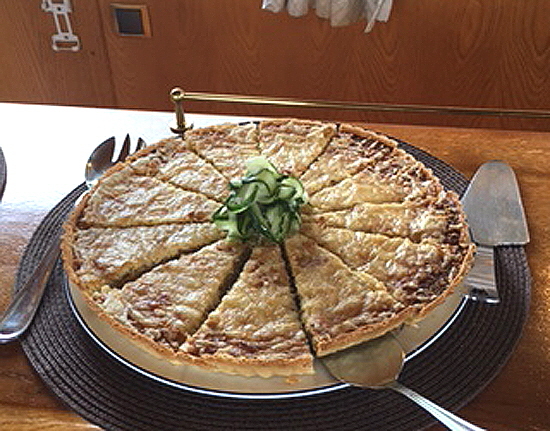 When we reach the barge, the crew of six welcomes us with flutes of icy champagne, canapés and “happy to have you aboard” smiles. My cabin is comfortable and cozy with plenty of room to store clothes; the bed and pillows the highest quality. There’s time to unpack, shower and stroll into the tiny village of Escommes before dinner. The barge remains docked overnight, and we regroup around the dining table at 7:30. Chef Rory has prepared a traditional coq au vin, rich with sweet baby onions, carrots and farm raised chicken (bought at a local market just hours before our arrival) that he pairs with Santenay Prosper Maufoux red and a white. In the afternoon, Daniel drives us to the 14th Century Chateau of Bussy Robutin, in the Ouche Valley; we explore its maze and expansive gardens. Back on board, we sip champagne, share impressions of our day’s outing and prepare for dinner. 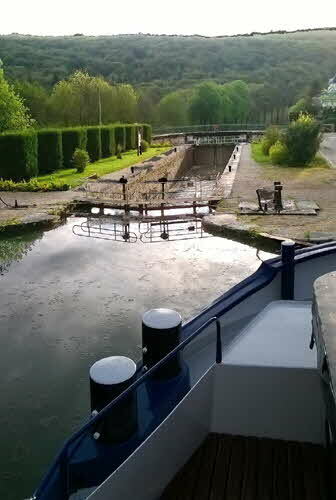 The barge overnights in Vandenesse-en-Auxois. Breakfasts, a bountiful buffet, include: cereals, local fruits, cheeses and meats, pitchers of fresh squeezed orange juice, pots of strong French coffee and crusty baguettes Daniel buys each morning at a local boulangerie. Eggs any style are yours for the asking, and when I discover Rory scrambles them in cream and butter, adding chives from the deck garden, I order them everyday. Tommy navigates the barge through 12 locks on our way to Pont d’Ouche, crossing the only bridge on the Burgundy Canal. The ritual of opening the locks to release and lower the water is fascinating; a team of lock keepers zip from lock to lock on motorbikes (many women). As the barge makes its way, (transcending 42 locks in 6 days), we walk and bike along the tow path; the rain swollen river rushes by faster than the movement of the barge; locals pass us walking their dogs and nod. When we have had our share of exercise, we regroup around the table, excited to learn what Chef Rory has prepared for today’s lunch. Meals are announced with the clanging of a ship captain’s brass bell. Some days lunch is plated; others a buffet spread with mounds of fresh salads, steamed vegetables, seafood, pates and an assortment of local cheeses. 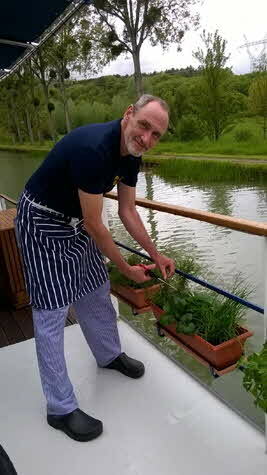 Chef Rory cuts fresh herbs from boxes that line the deck. Before every course, Karima explains the region and characteristics of the wines and cheeses we are being served. A wide selection of excellent, and often exceptionally light, medium and full bodied premier and grand cru chardonnays, pinot noirs, roses and burgundies are poured freely at lunch and dinner Bottle after bottle are opened with pleasure; our glasses are always full, and there is also a fully stocked help yourself bar. Today, Chef surprises us with a soft dry rose that pairs wonderfully with grilled guinea hen over rice, served with grilled heirloom tomatoes. 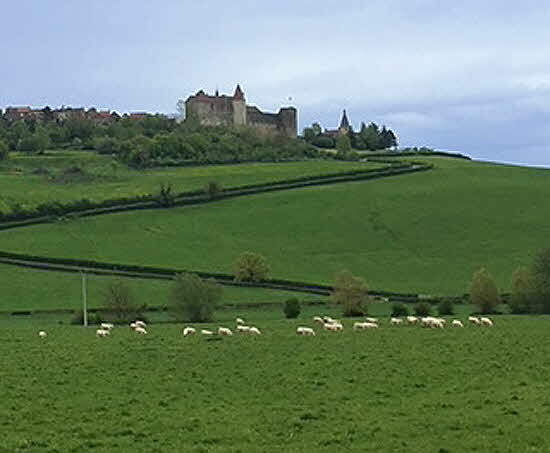 After lunch, we visit the medieval village, craft shops and castle of Châteauneuf-en-Auxois, once an outpost of the Dukes of Burgundy. We find a treasure in a tiny antique shop as we wander the cobblestone streets. Heavy rain bounces off the canal; but it doesn’t dampen our spirits and sense of adventure; two ducks don’t seem to mind the downpour either as they glide by; thick clouds and mist rise over the meadows. After a short morning cruise, we drive to Beaune, capital of Burgundy wine country, for a private tour and tasting at Domaine Bouchard Père & Fils. The Domaine, originally a military castle, produces 2.5 million bottles a year, has three levels of wine cellars... including a rare wine museum that houses 2,000 priceless wines, the only place in the world one can find drinkable wines from the 19thcentury. As we wander from room to room, we observe mold on the bottom of many bottles. 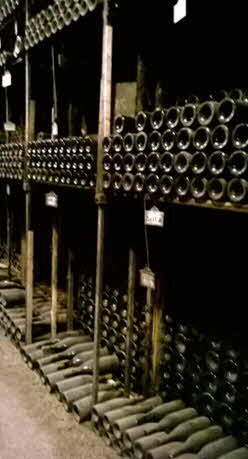 To understand and analyze aging, every 25 years each of these bottles is brought into a sterilized laboratory where they are opened, sit for 24 hours to keep sediments at the bottom, and then tasted, recorded and re-corked. After organizing the shipping of our favorite wines, we cross a garden for a gastronomic dejeuner in the Orangery, a private dining room in Château de Beaune. After lunch, we explore the town and visit the fascinating 15th century Hospice de Beaune, completed in 1451 by a wealthy religious man to house and care for the poor. After an exhilarating day, we return to the barge for a short evening cruise to La Bussière, where we dock for the night. We have settled into a relaxed routine of waking at one’s leisure. After breakfast, we cruise to Sainte-Marie-sur-Ouche. Rain continues to fall, but I have a plastic hooded poncho and enjoy a brisk walk. Tommy steers the boat through the locks; Albert assists in keeping it from hitting the sides. We pass through 12 more locks; charming stone lock houses line the canal; weeping willow trees droop in the rain. Our afternoon excursion takes us to Clos de Vougeot, built by the Cisterian monks in the 12th Century. It is the headquarters of the esteemed Chevaliers du Tastevin. (who annually award prized special labels to the finest Côte d’or vintages). We enjoy a tasting of fine Burgundy wines in the cellars of domaine Château André Ziltener, and then a tasting of Gevery Chambertin at the domaine of Phillipe Leclerc. 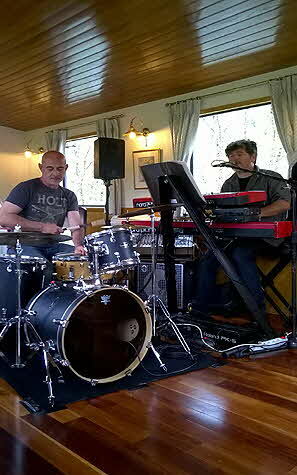 We return to the boat, two musicians, brought onboard as a surprise; entertain us during the cocktail hour. I have adjusted to the slow pace of life in the bucolic French countryside. My ears are sensitive to the sounds of frogs mating in the thrush; birds flitting from tree to tree, and the purity of a peaceful world. The sun is shining, and I am excited to visit “the city of mustard”. Dijon is charming with cobblestone streets, preserved architecture and magnificent churches. 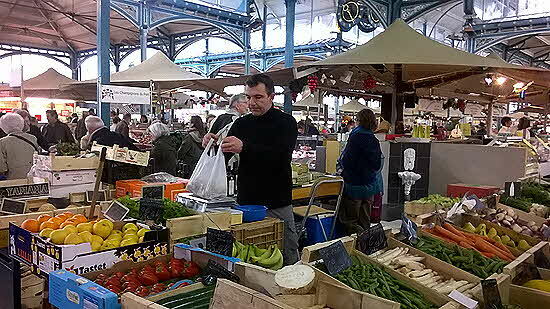 Locals are all about food and shop daily in the vividly colorful indoor/outdoor markets and shops. 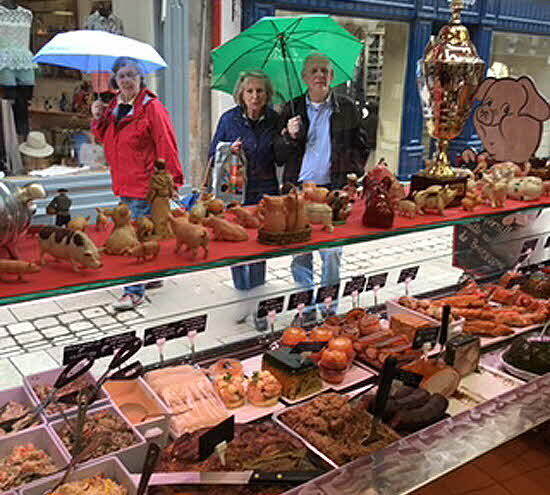 We wander from stall to stall, overwhelmed by the endless array of organic and heirloom produce, huge strawberries and raspberries, mounds of olives and garlic, fresh caught fish and seafood, hunks of ham, home churned butter and aromatic cheeses... displays are works of art. We buy jars of herb infused “made in Dijon” mustards and thick slices of rabbit and country pate to take back to the boat and share. We return to the barge for a late lunch. Rory has prepared a tangy dish of mussels and clams in an aniseed cream sauce. In the afternoon we make our way through the last stretch of the canal before our final mooring in Fleury Sur Ouche. Throughout the cruise, Chef Rory titillates and tantalizes our taste buds with his love for cooking and pleasing:; serving us home made soups... pan fried seared duck breast with polenta and braised red cabbage... bass poached in white wine with buttered petit peas and purple baby potatoes... medallions of lamb served with hand whipped truffle and parsley mayonnaise... filet of pork wrapped in Parma ham with braised endive and roasted cauliflower... and his decadent deserts. It is a festive evening, and we dress for the occasion. We are served our last epicurean feast: fois gras with cherry and onion marmalade on toasted risotto, filet of beef with a spinach terrine and wild mushrooms, and a chocolate birthday cake for Jerry, artistically decorated with candles and flowers. Many toasts are made as we sip Puligny Montrechet and a Hospice de Beaune. After many bottles of these exceptional wines, four of us slip into the hot tub. Daniel serenades us with his guitar. After a leisurely breakfast, we head back to Paris, sad to leave Daniel, Tommy, Rory, Laura, Albert and Karima... the friendly crew we may never see again. It was an amazing and memorable experience, far beyond expectations, and I thank you all for sharing so much love, knowledge and fun. My XL Airways flight back to New York is Xtra Large in amenities and service. I am most impressed with the attentive crew and the hot meal of pasta stuffed with eggplant and spinach, shredded carrot salad and chocolate pudding, served shortly after we reach cruising altitude. Movies can be watched on individual notepads or in 3D with innovative immersive cinema glasses. Developed specifically for air by the French start-up Skylights, they allow passengers to enjoy a unique experience at 36,000 feet. For an “affordable airline” XL Airways is pleasing passengers, seats are comfortable, baggage is free... and the flight was full. © July 2016 LuxuryWeb Magazine. All rights reserved.